The electric vehicles revolution is here! Or is it? If it is, when did it start? If it isn’t, then what’s all the fuss about? Pondering these questions to me is like trying to figure out what will happen after Brexit – if it happens at all. Hey! Let’s leave it there shall we?! Anyway, back to electric vehicles. Are they really that revolutionary? After all, Thomas Parker made a good attempt at commercialising an electric vehicle in 1884 and, a bit like the Tesla story, it was all about the battery. In fact, there were twice as many electric vehicles registered in the USA in the early part of the 1900s as there were gasoline vehicles. People were even thinking about fast charging and battery exchange schemes around this time. So electric vehicles are far from new, and certainly aren’t as revolutionary as the introduction of the automobile itself. The demise of electric vehicles in the 1920s was largely due to the growing abundance of oil and gasoline. Petrol engines could go further and take you there faster. Ironically, nowadays it’s oil again that is driving change. I guess you could liken it to the shift from horse to car in the early 1900s. Back then it was horse droppings piling-up on our streets. Now it’s gigatonnes of CO2 piling-up in our atmosphere. My interest in electric vehicles stems from the materials used and the constant need for lightweighting. Quite clearly the lightweighting trend will continue for decades, even with improved power density, as we strive to go for longer and to get there faster. Innoval is dedicated to this weight reduction initiative, and several of our collaborative projects are focused on this. Within these projects alloy developments mean aluminium can perform in areas previously reserved for steel, such as in crash structures. We are also helping to develop forming technologies that rival the speed and simplicity of traditional cold stamping, while preserving the high strength properties of the aluminium alloy used. The Innoval team is also participating in projects to develop recycling routes for the aluminium scrap already in the system. Imagine being able to successfully sort mixed grade scrap from a variety of sources, whether it be cast, extruded, or rolled. Then being able to segregate it into distinct grades for remelting and reintroduction into the casting or rolling process. This is the kind of thing we do with our clients, and we do it well. The aluminium advantage keeps on getting bigger! In my ponderings I got to thinking about autonomous vehicles and the impact that they will have on vehicle design and use. We can already describe many of today’s cars as ‘autonomous ready’. They have sophisticated sign-recognition 360o cameras, anti-collision and lane departure warning systems, pop-out cupholders…you get my drift. However, one thing is in the way of full-scale, fool-proof autonomous vehicle take-up. There’s around 1.25 billion non-autonomous vehicles which we somehow need to work out of the system. It’s going to take some time. In the meantime, software engineers must devote a considerable amount of their effort into designing systems around people (like me) who punch the air whenever they go through the gears perfectly smoothly on a hard acceleration. I must add, for legal and safety reasons, I perform the air punch retrospectively and in stationary traffic! Anyway, I digress, or you could say I’ve drifted into another lane. Back to lightweighting. So, how far can we go? Well, here’s food for thought. In the new age of fully autonomous passenger transportation modules, will we see the need for lightweighting disappear altogether? After all, these transportation modules will never crash into one another (or into anything for that matter). Gone will be those heavy crash structures (they’re for crashing, right?). And there’ll be no battery as by then some bright ‘spark’ will have perfected Inductive Power Transfer (like on your toothbrush). Actually, IPT isn’t a pipe dream. The batteries of electric cars could soon be charged wirelessly as they drive on the roads, as part of a new £40 million ($53 million) UK Government proposal. Let’s hope they sort out the potholes first! 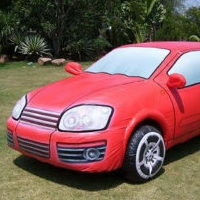 What about the inflatable car? I’m guessing it will be decades before we have fully autonomous cars – and I don’t think it will be revolutionary. As we’ve seen since the horse and carriage fell out of favour, I think the process will be more ‘evolutionary’. In the meantime, the aluminium industry will be busy today and in many years to come, shaping the future of transportation. On that note, I will put my thoughts aside of a brave new world where ‘sometime in the future’ people will be shuttled around in Zorb-like inflatable cars that can be conveniently collapsed away at your journey’s end and put, well, into the back of your car? Steve joined Innoval in 2018 as our Business Development Manager. He helps us to find new clients and further relationships with our existing clients.